On the 8th of January I had the absolute pleasure of meeting David Johnson. A retired chemist and teacher with a keen interest in family history amongst many other things! I met with David to discuss his recently self-published book that was produced by us, as well as capture a number of photos. David first came to us in late spring, in which he laid out his vision of collating and condensing 40 years of research into his family history into a coherent hardcopy book. He aimed to do this with the intention of gifting a copy to each of his children for Christmas, as well as having enough leftover copies for the numerous grandchildren. David went on to explain to me his reasoning behind having his work and research printed and put into a physical form. A big factor was the fact that technology has been advancing at an unprecedented rate in recent years, and therefore if he were to compile his evidence into some kind of digital format, the technology required to access or read the research may become obsolete. And although David has already formatted the family history onto a website, his concern was the burden of maintenance and associated costs for his family. He therefore decided that 10 physical copies would be most appropriate in preserving his research and even photos of ancestors and family. It’s reasons such as these that could potentially explain the recent rise in popularity of physical books, and decline of e-books and e-readers. Upon the completion of his draft copy, David went out in search of a company to produce it. And as we are local to David, and after hearing about our expertise and quality, he decided to have it produced by us, and for that we are grateful. He found us exceptionally helpful during the process, and said that we were able to explain and correct issues that he had encountered. For example, David struggled to visualise what his photos would look like on paper using our ink compared to on his screen or from a standard home printer that most of us would be used to. Our graphic designer, Richard, subsequently printed all photos/illustrations to make sure they came out to a high enough standard, and made adjustments accordingly. The books were finished and delivered in time for Christmas, and his two sons “were bowled over by it!” David went on to show his gratitude and say how pleased he was with the work that we produced. 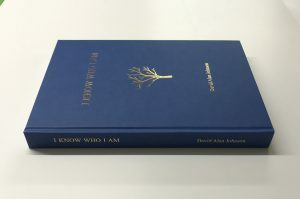 And at the end of it all, David’s book ‘I Know Who I Am’ isn’t just a book on family history, but a representation of a whole lot more. It represents the endless hours of research, the rabbit holes and red herrings that often deceived him and the significant investment that he has put into the project, whether it was trips to and from various archives, or the purchase of death, birth and marriage certificates. His pursuit of piecing together his family history uncovered many interesting stories, some tragic and some humorous and now that this particular project has come to an end, we can state how grateful we are to have been a part of this journey. We think David should be immensely proud of all of his book and all that it represents. Since then, David has again been in contact regarding a second volume! This time the book will be a compilation of his wife’s family history as appose to his own. The book will quite rightly be called: ‘I know Who You Are’ and he has stated how he would be keen for us to also produce this volume later this year. We look forward to working with David again! 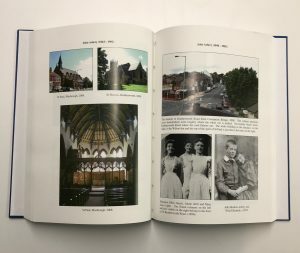 If you have ever considered having a book published, whether it be a book of family history or a collection of short stories, please don’t hesitate to get in touch. Our experience in this field and our willingness to be as helpful and accommodating as possible will put you on the path to becoming self-published!